The team of Amanda White and Tanya Tibbets took both first and third place in the Hotto Potto Cook Off. Their winning recipes were Mushroom-Tofu Pearl Balls (3rd) and Ten Flavor Tacos (1st). 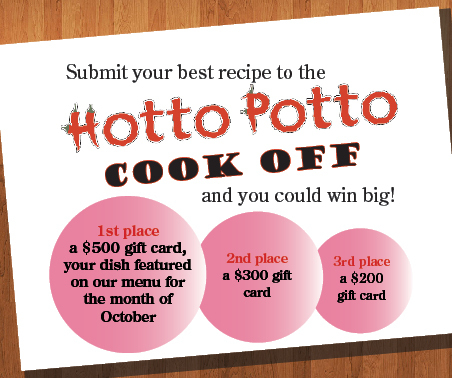 They took home a whopping $700 in Hotto Potto gift cards. That’s a lot of hot pot! Amanda and Tanya’s recipes used Hotto Potto’s Szechuan Paste, Mushroom, and Szechuan Chili sauces. David Fluss’ Pan Cooked Salmon earned him second place in the Hotto Potto Cook Off. His prize was a $300 Hotto Potto gift card. David’s recipe used Hotto Potto’s Sacha, Mushroom, and Szechuan Chili sauces. Thanks again to everyone who submitted a recipe. It was just great to see the ways you used our sauces and that they really are helping you create amazing meals at home. Keep coming up with new ideas; with your help we can do this again next year! Connect on social media to keep up with news about our sauces, our restaurant, and how you can be the winner of the next big prize!